Dylan makes a surprise appearance at Camden Lock market, an open-air market in Camden Town, London, where he is filmed in a restaurant called Fluke’s Cradle and walking around in a top hat and frock coat by ex-Eurythmic Dave Stewart. The resultant footage appears as a promotional video for “Blood in My Eyes” cleverly lip-synched and intercut with shots of Dylan signing autographs and walking among the crowds. Dylan is accompanied by his regular bodyguard, Jim Callaghan, but remains very approach- able throughout the afternoon, even when dining at the restaurant. 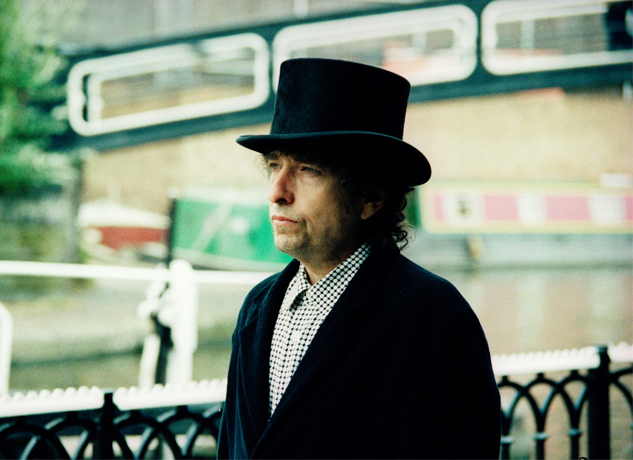 On July 21, 1993 Bob Dylan walked around in Camden Town, London in a top hat filming the video for “Blood In My Eyes”. He signed autographs and seemed relaxed. There are many cool pictures of this event, here are 18. And of course the video for “Blood In My Eyes”.